TROUBLE IN TIBET – ART OF SALUTING NATIONAL FLAG. SEMINARS AND CONFERENCES ON PHILOSOPHY AND SCIENCE WILL NOT PROVIDE TOOLS NEEDED FOR FREEDOM STRUGGLE. His Holiness the Dalai Lama attended Seminar on ‘Interactive Query in the Field of Ancient Indian Philosophy and Modern Science on Saturday, April 30, 2016. Such Seminars and Conferences will not provide tools needed for Freedom Struggle. Now, it is right time for Dalai Lama to learn Art of Saluting Tibetan National Flag. It is not enough if Tibetans show, display their National Flag. 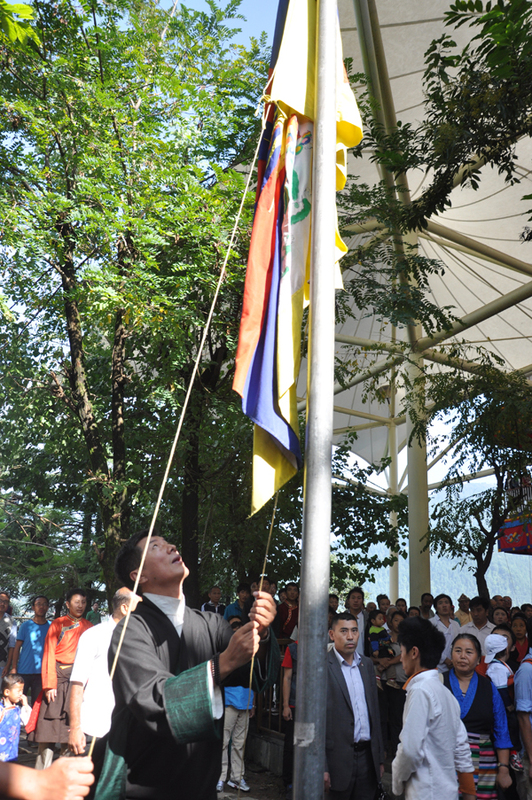 It is important for Tibetans to unite behind Tibetan National Flag and Salute it in recognition of Unity it symbolizes. Trouble in Tibet – Art of Saluting National Flag. Tibetans need tools for Freedom Struggle. Dharamsala (Himachal Pradesh), Apr.30 (ANI): Tibetan spiritual leader, the Dalai Lama attended a seminar on ‘Interactive Query in the Field of Ancient Indian Philosophy and Modern Science’ here on Saturday. Buddhist monks and selected scholars participated in the discourse where ideas were exchanged on how to fuse spirituality and science in order to benefit humanity. Former Tibetan Prime Minister in-exile, Prof. Samdhong Rinpoche said that the seminar was an annual event since the last 34 years. “This is a part of the series of dialogue between the Buddhist science and modern science which is called the institution of mind and life which has been continued for the last more than 34 years,” said Rinpoche. “If the science, modern science and technology is being guided by spirituality, it can benefit humanity much more and reduce the destructive things,” he added. Copyright © 2010 aninews.in All rights reserved.